My sister is expecting her first child in November of this year, and is decorating the nursery in a nautical theme, with navy, aqua, and yellow. A couple of weeks ago, I made a quilt to match the nursery, and since I was finally able to give it to her this past weekend, I can finally share it. 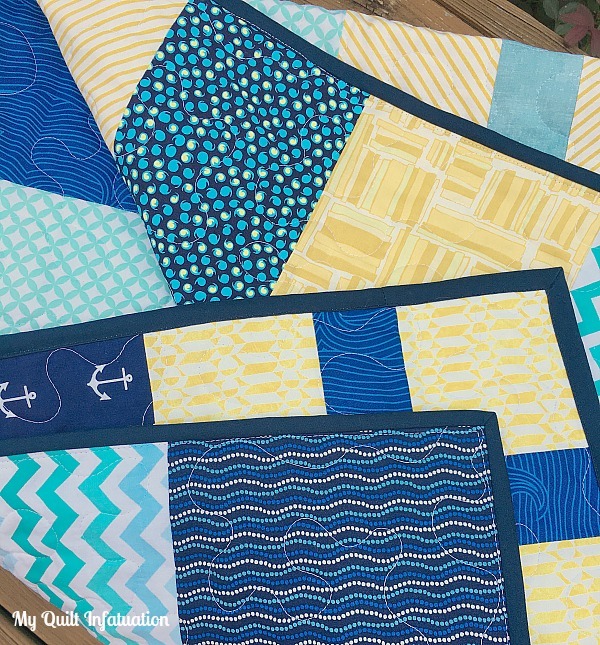 She asked for a quilt with the colors of the nursery, but with the exception of a couple of nautical fabrics, she did not want a themed quilt. Since I prefer to make quilts without a theme anyway, that was perfectly fine by me! I think the anchor and wave fabrics are the perfect subtle touch. When I think of nautical themed decor, I usually think of navy, aqua, and red, and although I really love that combo as well, the yellow is a fresh twist. This is definitely a palette that my nephew will appreciate for many years. 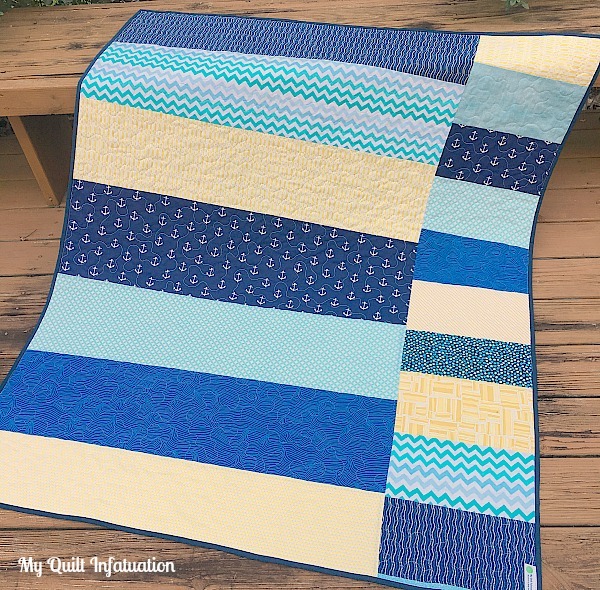 The colors and pattern of this quilt remind me of sunshine sparkles on the ocean, so I've named this one Sun Dappled Sea. I am pleased to report that my sister loves the quilt, and I can't wait to see a photo of it draped across the crib! This quilt goes together quickly and easily, but I really love the lattice effect created when they are put together. So perfect - not too babyish, to be enjoyed for many years to come. The choice of yellow does add a nice touch. What a fun quilt. The colours are great. I hope you get to have lots of snuggles when the baby arrives. Beautiful! I love the color combination. Great quilt! I've got nautical fabrics saved for a quilt, waiting for the right pattern; might just have found it! Lovely quilt. Colours and fabrics are great choices and as it isn't too babyish will be used for a very long time. Not surprised your sister loves it. 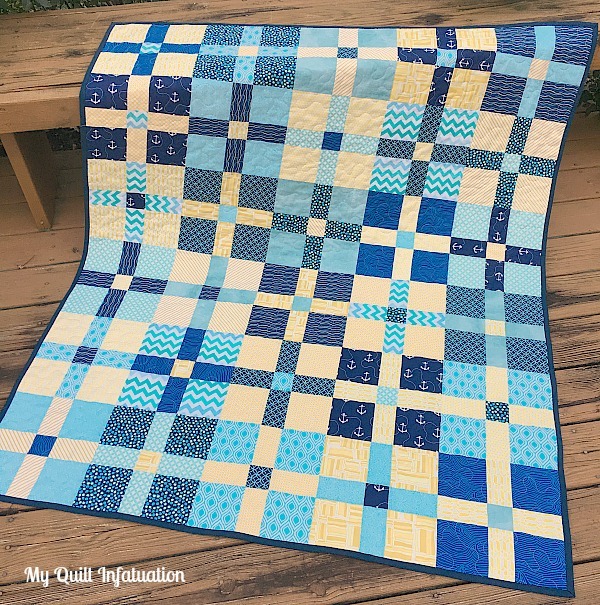 Love all of the blues in your beautiful quilt! Kelly I just love it and want to drape it over me! It really does look like a sea of blue and the sun dancing above. 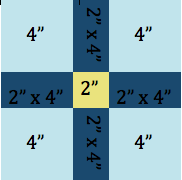 The Complimentary colors of blue & yellow truly are astonishing in your quilt. Thank you always, for the tutorials and the 9 patch is awaiting cutting in my sewing space. Nice job, Kelly!! Your new niece or nephew is sure to love it. So beautiful.Love your fabric combo.Great job top and back!! What a pretty color combo for a nursery! The colors remind me of the sea and sand, but I think it's a good idea to give just a hint of the nautical theme. The colors and design will grow well with baby to child. July Fabric Deals and Giveaways!